In the final stages of preparing to run an upcoming Legend of the Five Rings table-top campaign, I’m getting questions from players about the “right” way to play their Clans, their Schools, and their classes. L5R presents a society which is very unlike modern America, and the transition can be difficult or even jarring to new players. One in particular asked me about how the Scorpion Clan functioned in the game setting, and how he might be an effective member while also contributing to the game as a whole. 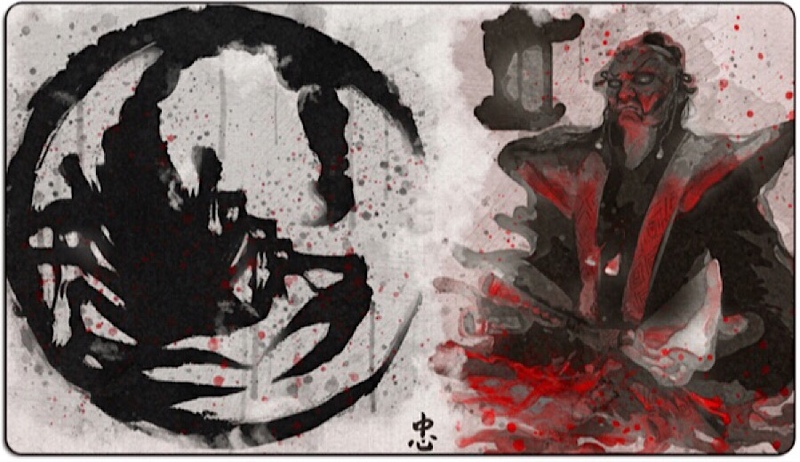 Having been a fan of the Scorpion since I first read about them in high school, and my long experience with L5R in general, I had a lot to say on the topic. I hope the below information may be useful not only to my player but also to others who are interested in crafting realistic stories set in the Emerald Empire. There are a few perspectives when it comes to playing a Scorpion the “right” way and, in the broader scope of the game, what it means to play one accurately to the setting changes with how the Scorpion are treated or presented in the setting itself. For some games the Scorpion are the underhanded yet in-your-face open secret like the Mob, where everyone knows that to mess with one of them is to suddenly have a need for arson insurance, but in those games I often find that Scorpion players (or NPCs) get short-shrift and are generally avoided entirely, because any “realistic” response from the Clan would be too heavy-handed from a GM perspective. Obviously the Scorpion, like most all other Clans, expect their members to take care of themselves and their own problems, but when it becomes an issue of optics and how the Clan or a family is viewed in court, then it becomes a big deal for the higher-ups. For my games I prefer to have Scorpion viewed like car mechanics – even when dealing with the ones who appear open and honest, there’s always that nagging voice in the back of the mind “is this person screwing me?” due to the underlying distrust of the industry and those in it. It’s not to say that any one mechanic is or isn’t, or is or isn’t taking some small advantage where possible, but the subtle suspicion is there. It won’t stop you from dealing with them, particularly because they provide a valuable service, but the question lingers. On the other hand, if you form a good bond with a mechanic and build a good rapport, you are going to be one happy individual, when it comes to your car. You’ll buy tires and not have to pay for an alignment, or he’ll replace that cracked windshield when he notices it during an inspection, that kind of thing. You’d never ask for those favors, because that would both be rude and change the dynamic of the relationship, but he’ll go out of his way to make sure you’re taken care of. That’s how I like to present the Scorpion – by and large they are regular samurai without any sort of ulterior motivation or secret plots. That’s not to say the stereotype doesn’t exist for a reason, or that there are those with personal experiences that make them distrust or even hate the Clan, but the same could be said for samurai from all corner of the Empire. The Scorpion Clan isn’t some single-minded blackmail web where any member can run up to any other member, whisper a code phrase, and get any help they need (no matter what some Crane artisans would have you believe). Like with all Clans they have a specific focus and a commitment to the Empire, but they also recognize that there are limits what results “polite society” can yield, and are by and large willing to do what is necessary to get the job done. Almost never will the samurai involved in these endeavors see, know, or understand the depth of the plot or plan in which they are participating. Theirs is to act and to do as one is told, not to question why. I don’t mean to say that these orders come down often or lightly; most all Scorpion will never participate in any sort of larger-scale hidden agenda. In addition to self-reliance the Scorpion are very effective at teaching the ability to size up and examine a situation, to look for opportunities others may miss. After all, they have been tasked by Hantei himself to address and fight those threats against which the other Clans are woefully ill-equipped. Scorpion have a heightened sense of their own self-importance, but they recognize that they are victim to it just as much as every other Clan is. Clan stereotypes are useful and generalizations effective, but each individual samurai is unique. The Scorpion may have “more” resources available to them in courts and as far as information gathering goes, but each other Clan has their unique advantages and areas of supremacy too, and those aren’t to be overlooked. A Crane courtier will have someone killed as readily, if not more quickly, than a Matsu bushi. There is a specific appendix in the back of the 1st Edition Way of the Scorpion book which talks about the experience of playing a Scorpion. Paraphrased here, one of the original L5R playtesters lamented that they’d be having more fun as any other Clan, because while the Crane hate the Lion and the Lion hate the Crab and the Crab hate the Phoenix, everyone hates the Scorpion. John Wick (the original writer for the L5R RPG) is a fairly grognardian, DM-as-antagonist role-player, and a lot of that comes out in his writing on the Scorpion Clan. This is where the old image of the Scorpion as the Rokugani mafia comes up, and he includes several heavy-handed ways for someone to strike back against others who would make fun of or abuse a Scorpion samurai. That isn’t to say that all of his advice is out of scope for our campaign, and in fact there are several good sections that I think are worth reposting in full. In the above, John Wick expresses that Scorpion are by and large not concerned with bushido or Honor, and in fact includes some optional rules to represent the difference between Loyalty and Honor, but over the editions that outlook has softened and changed, and I approve of the gradual reeling in of the “other-ness” with which the Scorpion were originally written. They are still able to exercise a great degree of freedom and personal creativity that other Clans aren’t, but also play by the same (general) rules as everyone else. Loyalty is a key tenant of Bushido, and the one to which they ascribe most directly. That doesn’t mean they ignore the rest, but perhaps understand the limits thereof, and also how they can be used not only as pillars of strength but also as opportunities for weakness in others. I’ve written a whole lot and not yet talked at all about this campaign in specific, and to some degree that was intentional. I want to write a more generalized email to the whole group about what I’m hoping to present and hoping to see with The Famine, and I think that advice and genre information will be very-well received by everyone. I’ve spoken to another player at length about the role of shugenja in Rokguani society, and I want to do the same with you as well, because I want to make sure that we start off on the right foot, as it were, when it comes to being true to the setting; the last thing I want to do is to “correct” someone and have it come out of left field or feel like railroading what someone believes their character should do. I hope this email has been useful, or at least to some extent beneficial, and I have high hopes for how you’ll contribute to the campaign.